18k White gold, White sapphires. This ring was commissioned to celebrate the birth of a baby. Daddy, Mummy and Baby Sapphire sit in two-tone cups made from two different 18k white gold alloys. To read more about how this piece was made click here. 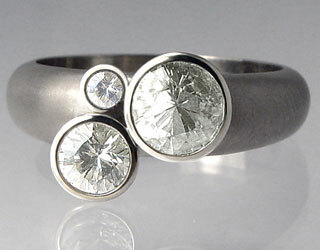 LOVE this setting...can you do it with diamonds? What size are the stones? And what a great ring it is!!! It is still worn with pride and is usually the centre of attention when the eternity ring question crops up. Why have an eternity ring when you can have something better. Eva, many thanks. I will be back shortly. Great work, I am interested in how you used CAD. Nice web site also. thanks.